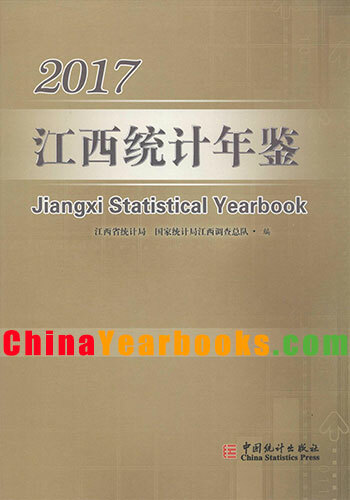 Ⅰ.Jiangxi Statistical Yearbook 2018 is an annual statistics publication,which covers very comprehensive data in 2017 and some selected data series in historically important years and the most recent thirty years at level of province and other provinces and municipalities.Therefore,reflects various aspects of Jiangxi’s social and economic development. Ⅱ.The yearbook contains the following twenty-two chapters,General Survey;Population;Employment and Wages;Investment in Fixed Assets;Energy;Price Indices;People’s Livelihood;General Survey of Cities;Ecological Environment;Agriculture;Industry;Construction;Transport,Post and Telecommunication Services;Domestic Trade;Foreign Trade and Economic Cooperation;Tourism;Financial Intermediation;Insurance;Real Estate;Education,Science and Technology;Culture,Sports and Public Health;Social Welfare and Other Social Activities;Main Statistical Indictors on provinces,autonomous regions and municipalities and Notes of Jiangxi Statistical Events in 2017.For readers’ convenience,in Brief Introduction at the beginning of each chapter,main coverage of this chapter,data sources,statistical coverage,statistical methods and historical changes are concerned.In addition,Explanatory Notes on Main Statistical Indicators are provided at the end of each chapter. 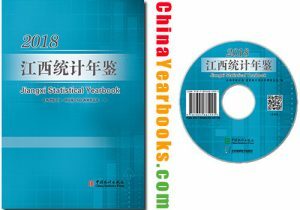 Ⅲ.This Yearbook re-audited statistic data published previously,any data different from this yearbook,take this yearbook’s as standard data. Ⅳ.The units of measurement used in this yearbook are internationally standard measurement units. Ⅴ.Statistical discrepancies due to rounding are not adjusted in the yearbook. Ⅵ.Notations used in the yearbook:blank space indicates that the figure is not large enough to be measured with the smallest unit in the table,or data are unknown or are not available;”#” indicates a major breakdown of the total. 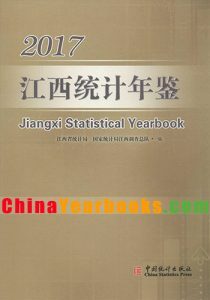 Ⅰ.Jiangxi Statistical Yearbook 2017 is an annual statistics publication,which covers very comprehensive data in 2016 and someselected data series in historically important years and the most recent thirty years at level of province and other provinces andmunicipalities.Therefore,reflects various aspects of Jiangxi’s social and economic development. Ⅱ.The yearbook contains the following twenty-two chapters,General Survey;Population;Employment and Wages;Investmentin Fixed Assets;Energy;Price Indices;People’s Livelihood;General Survey of Cities;Environment Protection;Water Resources andMeterology;Agriculture;Industry;Construction;Transport,Post and Telecommunication Services:Domestic Trade;Foreign Tradeand Economic Cooperation;Tourism;Financial Intermediation;Insurance;Real Estate;Education,Science and Technology;Culture,Sports and Public Health;Social Welfare and Other Social Activities;Main Statistical Indictors on provinces,autonomous regionsand municipalities and Notes of Jiangxi Statistical Events in 2016.For readers’ convenience,in Brief Introduction at the beginning ofeach chapter,main coverage of this chapter,data sources,statistical coverage,statistical methods and historical changes areconcerned.In addition,Explanatory Notes on Main Statistical Indicators are provided at the end of each chapter. Ⅲ.This Yearbook re-audited statistic data published previously,any data different from this yearbook,take this yearbook’s asstandard data. IV.The units of measurement used in this yearbook are internationally standard measurement units. V.Statistical discrepancies due to rounding are not adjusted in the yearbook. VI.Notations used in the yearbook:blank space indicates that the figure is not large enough to be measured With the smallestunit in the table,or data are unknown or are not available;”#” indicates a major breakdown of the total. I. Jiangxi Statistical Yearbook 2014 is an annual statistics publication, which covers very comprehensive data in 2013 and some selected data series in historically important years and the most recent thirty years at level of province and other provinces and municipalities. Therefore, reflects various aspects of Jiangxi’s social and economic development. II. The yearbook contains the following twenty-two chapters, General Survey; Population; Employment and Wages; Investment in Fixed Assets; Energy; Price Indices; People′s Livelihood; General Survey of Cities; Environment Protection; Water Resources and Meterology; Agriculture; Industry; Construction; Transport, Post and Telecommunication Services; Domestic Trade; Foreign Trade and Economic Cooperation; Tourism; Financial Intermediation; Insurance；Real Estate；Education, Science and Technology; Culture, Sports and Public Health; Social Welfare and Other Social Activities; Main Statistical Indictors on provinces, autonomous regions and municipalities and Notes of Jiangxi Statistical Events in 2013. For readers’ convenience, in Brief Introduction at the beginning of each chapter, main coverage of this chapter, data sources, statistical coverage, statistical methods and historical changes are concerned. In addition, Explanatory Notes on Main Statistical Indicators are provided at the end of each chapter. III. This Yearbook re-audited statistic data published previously, any data different from this yearbook, take this yearbook’s as standard data. IV. The units of measurement used in this yearbook are internationally standard measurement units. V. Statistical discrepancies due to rounding are not adjusted in the yearbook. VI. Notations used in the yearbook: blank space indicates that the figure is not large enough to be measured with the smallest unit in the table, or data are unknown or are not available; “#” indicates a major breakdown of the total.